In 2013 the presidential elections resulted in a new president, the moderate Hassan Rohani. Outwardly Hassan Rohani is nurturing relations with the West, but inside Iran the oppression has continued as before, with journalists being imprisoned and newspapers being closed down. How far would you be prepared to go for freedom of expression? Would you risk the lives of your relatives, and indeed your own? Would you risk imprisonment, torture and other atrocities? 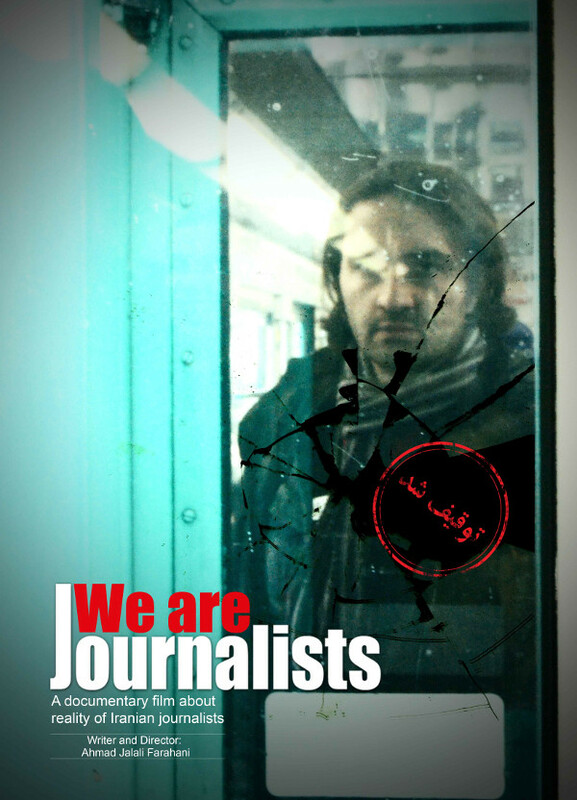 “WE ARE JOURNALISTS is a documentary film that covers a decade of many Iranian journalists struggle to survive in Iran, under the Ahmadinejad regime. The film is based on the personal story of the director during ten years. Ahmad Jalali Farahani, the director of this documentary film is an exiled Iranian film maker and journalist, persecuted and tortured by the Ahmadinejad regime. Ahmads film pays homage to the great, cultural, heritage of Iran with his use of the classic, oral story telling tradition; his poetic, narrative supports the whole film, while secretly filmed material, never previously shown, is interwoven like a fine carpet. This film is an artistic, spoken and visual narrative that exposes the terrible wounds inflicted on the people of Iran, who have such a passion for freedom of expression. The film opens with images of the religious, day of mourning, called Ashour; these beautiful shots are juxtaposed against unprecedented film, of the religious, dictatorships, campaign of terror against peaceful demonstrators, which occurred on the very same day. Ahmad bears witness to this horror and his narrative story describes his feelings of disbelief and helplessness. This film lays bare not only Ahmad’s personal pain and suffering in his relentless fight for freedom of expression, but also the plight of many Iranian journalists, who lost their livelihoods, when the newspapers they worked for were banned. The film also describes the story of the journalists’ unions’ courageous fight against a draconian, religious dictatorship through a series of interviews with key players. Finally, the film exposes the dirty tricks and total corruption of the regime during the last elections and ends with a series of poignant interviews made with exiled Iranian journalists. This documentary film takes us behind the façade of religious correctness and penetrates the lies, hypocrisy and the subterfuge of the Ahmadinejad regime, who have imprisoned, tortured and murdered in an attempt to silence their people. By Ahmad Jalali Farahani, October 2014. 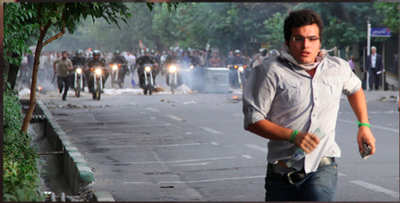 My primary purpose in making the film is to tell my own story and that of other Iranian journalists. In order to do so I feel it’s my duty to spite the torture and imprisonment. 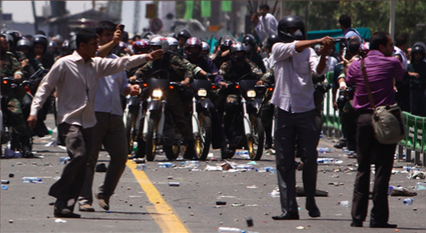 I want my film to serve as a voice for the Iranian journalists who run such huge risks. President Rohani has made a few changes in Iran and the government is now on speaking terms with the West, but the conditions endured by journalism there are as bad as ever. Large numbers of journalists are currently incarcerated in Teheran, including many of my friends. I grew up knowing the importance of telling the truth and expressing my views no matter what. My parents both had the same attitude. My father was killed in the revolution in 1979 and my mother was shot in front of me when I was a nine-year-old boy. After that I was put into a children’s home. But I was lucky: the head of the home introduced me to the stage and I went on to get a job at a cinema, where I learned about film and was also given the opportunity to make short films of my own. When I grew up I did theatre and media studies at university in Teheran. On becoming a journalist in Teheran I discovered that journalists were unable to discuss or write about the challenges facing them in their work. They were unable to speak openly about censorship, economic issues, the lack of rights and other vital matters affecting their lives and families. So I decided to make a film on the subject. Ahmadinejad became president. Conditions for journalists got worse and worse, reinforcing my determination to further my idea of a film. That was in 2005, a particularly difficult time for journalists. Independent journalists were all shocked and disappointed by Ahmadinejad and his regime. That was the starting point for my film. Those of us who became journalists then did so during a period of reform when Iranian political history was changing, but due to corruption and election fraud the reformists lost the election to Ahmadinejad. This sudden change to our lives impressed on me the necessity of documenting the dramatic events taking place in Iranian society. I knew I would never get official permission to make the film. So I decided to make it as an underground film. It was a fateful decision. It led to a number of appalling experiences for me and my nearest and dearest. 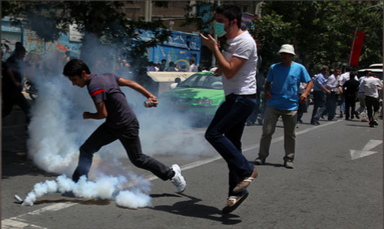 The restrictions on freedom of expression caused friction between the Iranian press association and the government. I filmed one of the association meetings; as a result I was seen with my camera. I realized the danger I was in but I decided to risk it in order to obtain evidence of the conditions facing Iranian journalists and the lack of rights. I was detained when I tried to film a meeting of the association board; it was my first face-to-face encounter with the security forces. After that I told them I would drop my plans for a film. But the following year – 2009 – we had our presidential elections. The reformist parties all backed reform-minded candidates, and most people were opposed to Ahmadinejad. And the election campaign kicked off in a way new to Iran: for the first time each party assumed a colour to campaign under, and the green movement was born in the streets of the country’s cities. These dramatic developments made me change my mind. I took my camera into the streets and began to film. But when the results of the polls were announced it was obvious that a coup had taken place and that the outcome had been rigged. What was a journalist to do? While the government continued its vicious assaults unimpeded, I decided to apply for a job on a radio station in Prague. The station broadcast uncensored programmes in Farsi to Iran. My application was successful but first I had to take an exam in Dubai. On my return from Dubai I was detained at the airport, releasing me a week later. But there were informers everywhere, and you were never safe. One of my best friends betrayed me to the security forces. He told them that I had used my camera during the protests. So I was detained for the third time. This time was more than just appalling. I was subjected to extreme methods of torture. Stuff I’d rather not talk about. Once again my life was just darkness, depression and hopelessness. But one thing mattered more than anything to me in prison. I missed my family so badly that I could weep. So I made myself a promise: I would never go to prison again. When they released me the security forces coerced me into collaborating with them as a journalist in order to betray those of my friends and colleagues who were opposed to Ahmadinejad. I had three options: collaborate with the regime, go back to prison, or emigrate. I chose the last. I hope that a large international audience will have the opportunity to watch my film and to realize that war will not bring democracy to the Middle East. We cannot build a democratic society without educating people who believe in the importance of human rights and freedom of expression: a society with justice and equality for men and women. I also hope that the Iranian people will also be able to watch my film without fear. In his film WE ARE JOURNALISTS director Ahmad Jalali Farahani directs our gaze at freedom of expression in a world in which the regime controls everything and the eight state-controlled television stations are the population’s favourite media. Footage shot using hidden cameras reveals the harsh reality in which Iranian journalists live and work. Ahmad was detained three times on account of this film. The third time he was subjected to some of the most extreme forms of torture. He tells us that in Iran they distinguish between black torture and white torture: the black version is physical; the white is by way of malicious untruths about a person, false front page stories, broken promises to release you, being forced to stand up for days at a time, trumped-up charges, assaults on your next-of-kin, etc. For 36 years, the Islamic Republic of Iran has been one of the world's biggest prison for journalists. In 1979 there was a revolution in Iran against the Shah, but after the revolution, the Iranians haven’t got the freedom they fought for. The oppression got worse in the new Islamic Republic. Due to the lack of expression, many journalists got imprisoned or killed. There were also many who chose to flee the country, or applying for jobs elsewhere. Iran ranks first among the countries where journalists have been forced to flee into exile over the past five years. In 1997, Iran got the first reformist president. He tried to provide more space for independent media. He also tried to create new media platforms, where young people, who had grown up under oppression, were employed. Between 1997 - 2005 there were over 2,000 new media platforms and more than 1000 different media were introduced. For the first time in Iran's history a Press Association was created with 3000 members. This period was called "the journalistic spring". In 2005, the reactionary, fundamentalist President Ahmadinejad came to power. Iran was a hell for journalists. The new regime began extensive purges. Again, many journalists were imprisoned or lost their jobs. In 2009 there was a new presidential election and most independent journalists urged people to vote for reformist candidates. IRIB is Iran's largest TV station with 8 channels. The national TV is under the control of Khomeini - Iran's supreme leader. Most Iranians are watching TV, while newspapers primarily are read by the middle class. The newspapers may not post any that are dissident. The majority of the Iranian population supported the reformist campaign and the Green Movement emerged. In the election June 12 in 2009 prevailed regime through massive fraud and corruption. In the period 2009 - 2010 were 150 journalists imprisoned, four journalists were killed, many newspapers were closed and more than 150 journalists fled Iran. In 2013 a new moderate president, Rohani was elected. But repression continues as before, both in terms of the imprisonment of journalists and newspaper closures. 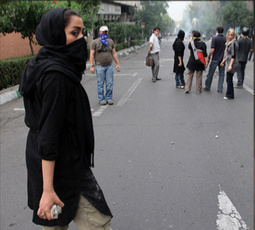 Being a journalist is one of the most dangerous jobs in Iran. The Iranian government can’t do anything. The supreme dictator is Khomeini. He has been in power for nearly 20 years. He would like to see Iran as a superpower, but the problem is trade sanctions and the relationship to the rest of the world. In order to create a viable economy for Iran to sell oil Khomeini would like to change the situation to the outside, but not the conditions inside the country.